Welcome to my new website! I'm thrilled to finally have everything in one place - my class info, shop & blog. This summer flew by! I loved teaching five sessions of "Let's Create...like the Masters!" this summer. I had so many sweet, creative students! We were inspired by four famous artists and I enjoyed learning more about them alongside my students. 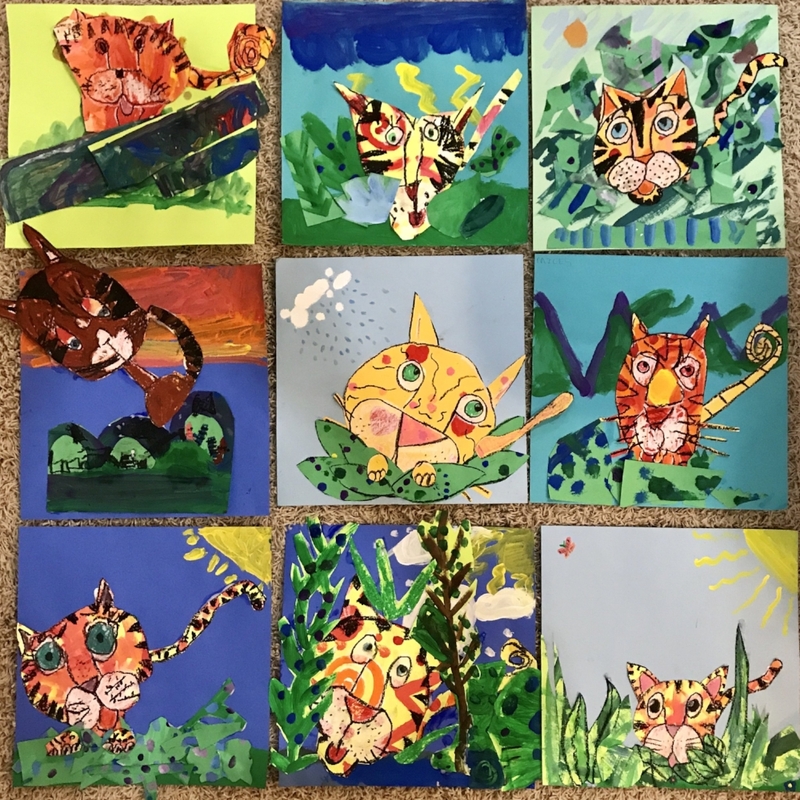 *We created our own collage jungle scenes, inspired by Henri Rousseau (1844-1910) - a self-taught artist from France, who, despite much ridicule & negativity towards his paintings, never gave up. Thank goodness he continued painting, even when the “experts” told him not to - His paintings can now be seen in museums all over the world! *We drew & painted colorful mixed-media cupcakes, inspired by Wayne Thiebaud (1920 - ) an American artist who is still living (age 96). He has contributed so much fun & color to the art world with his “pop art” style of everyday objects - cakes, desserts, toys, etc. His works are in museums all over the country! *We answered the question, “What would I look like if I was a cartoon character?” to create our own “cartoon” self-portrait in the style of American pop artist, Roy Lichtenstein (1923-1997). We used vibrant tempera paint sticks to add color! We learned that he enjoyed hiding cartoon characters such as Mickey Mouse & Bugs Bunny into his abstract works :) His work can be seen around the world as well! 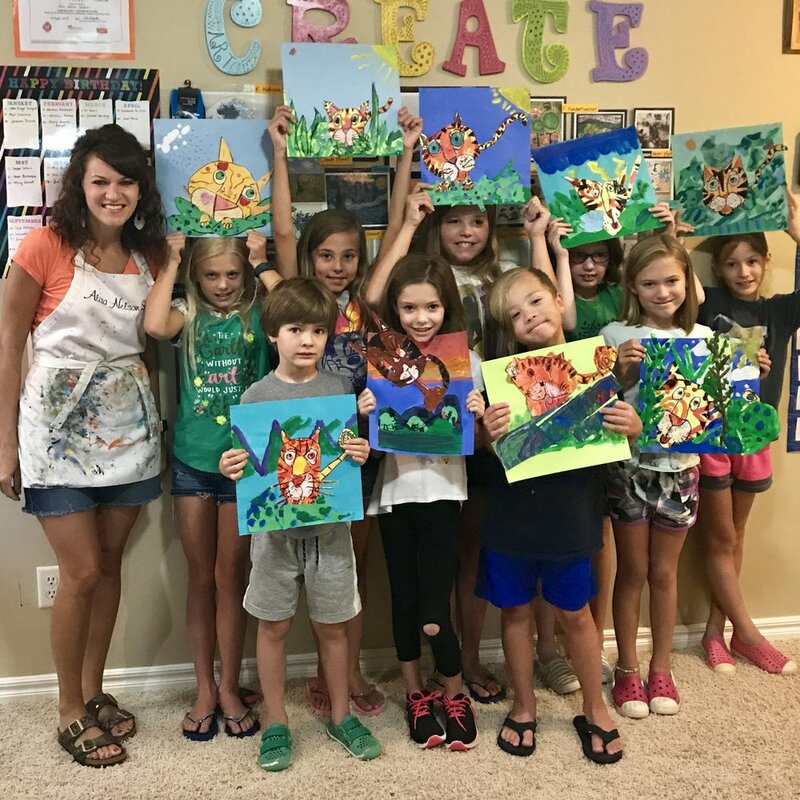 *We painted our own landscape painting, inspired by Impressionist artist from France, Claude Monet (1840-1926). His works have and will continue to inspire millions each year all over the world. We loved making values of blues & greens by adding white & black. Our brushes “hopped, tapped & dabbed to create strokes like the Impressionist painters.